The sample was made with Caron Simply Soft yarn. The base color is Bone 9703. The three stripe colors are Autumn Red 9730, Forest Floor 9950 and Chocolate 9750. The borders and three crocodile rows on either end are in the base color. The stripes are five crocodile rows separated by three crocodile rows of the base color. This chart gives the yarn requirements for this type of color striping scheme for the base color, the number of color stripes for each size of blanket, and the yarn requirements of each stripe color for a one, two or three color scheme for the stripes. Crocodile Stitch: the stitch is formed on a pair of dc with ch sps on both sides. Yarn over then insert the hook from front to back in the chain space before the first dc of the pair. Then from behind, insert the hook between the dc pair toward the front. Yo and pull through two loops, then yo and pull through last two loops. In the same way, make 4 more dc on that same dc, each below the last on the dc. Ch 1. Rotate the work so that now you can work on the second dc of the pair. Yarn over then insert the hook from front to back in the chain space after the pair of dc. Then from behind, insert the hook between the dc pair toward the front. Yo and pull through two loops, then yo and pull through last two loops. In the same way, make 4 more dc on that same dc, each above the last on the dc. The beginning chain should be a multiple of 6. Row 1: Sc in second ch from hook. Sc in each ch to the end. Row 2: Ch 1, turn. Sc in first sc. Sc in each sc to the end of the row. Rows 3 and 4: Repeat row 2. Row 5: Ch 2, turn. Hdc in the second sc, hdc in each of the next two sc, skip 1 sc, ch 1, 2 dc in next sc, ** skip 2 sc, ch 2, 2 dc in next sc. Repeat from ** across to last 5 sc. Skip 1 sc, ch 1, hdc in each of last 4 sc. Row 6: Ch 1, turn. Sc in first hdc, sc in each of next 3 hdc, crocodile stitch in first pair of dc, ** ch 1, skip next pair of dc, crocodile stitch in next pair of dc. Repeat from ** across to last 3 hdc and turning chain. Sc in each of the three hdc, sc in top of turning chain. Row 7: Ch 2, turn. Hdc in the second sc, hdc in each of the next two sc, skip 1 ch, ch 1, 2 dc between the dc pair on which the crocodile stitch was made, ** ch 2, skip ch-2, 2 dc between the dc pair that was skipped, but catching the ch between crocodile stitches, ch 2, skip ch-2, 2 dc between the dc pair on which the crocodile stitch was made. Repeat from ** across to last 4 sc. Ch 1, skip ch, hdc in each of last 4 sc. Row 8: Ch 1, turn. Sc in first hdc, sc in each of next 3 hdc, ch 3, skip first pair of dc, crocodile stitch in next pair of dc, ** ch 1, skip next pair of dc, crocodile stitch in next pair of dc. Repeat from ** across to last dc pair and 3 hdc and turning chain. Ch 3, skip last pair of dc, sc in each of the three hdc, sc in top of turning chain. Row 9: Ch 2, turn. Hdc in the second sc, hdc in each of the next two sc, skip ch, ch 1, 2 dc between the dc pair that was skipped, but catching the ch between crocodile stitches, ** ch 2, skip ch-2, 2 dc between the dc pair on which the crocodile stitch was made, ch 2, skip ch-2, 2 dc between the dc pair that was skipped, but catching the ch between crocodile stitches. Repeat from ** across to last 4 sc. Ch 1, skip ch, hdc in each of last 4 sc. Repeat rows 6 through 9 until afghan is desired length. After a row 6, work these final four rows. Fourth to last row: Ch 1, turn. Sc in first sc, sc in each of next 3 sc, sc in ch-1 space (do not catch part of the crocodile stitch that is to the back of your work), sc between the dc pair on which the crocodile stitch was made, ** 2 sc in ch-2 space (do not catch part of the crocodile stitch that is to the back of your work), sc between the dc pair that was skipped, but catching the ch between crocodile stitches, 2 sc in ch-2 space (do not catch part of the crocodile stitch that is to the back of your work), sc between the dc pair on which the crocodile stitch was made. Repeat from ** across to last 4 sc. Sc in ch-1 space (do not catch part of the crocodile stitch that is to the back of your work), sc in each of last 4 sc. Third to last row: Ch 1, turn. Sc in first sc. Sc in each sc to the end of the row. Last two rows: Repeat third to last row. Finish off and weave in end. 2/13/14 – added yarn requirements for striping scheme. 11/17/15 – in row 9, changed to “skip ch” in first line to be consistent with last line. I would like to do the stripes that you show in the picture, but I can’t figure out how many rows of each color there are since the stitches are overlapping. Is there a basic instruction for figuring out number of rows, such as always have even numbered rows? In general you always want to do rows 9 and 6 in the same color (so the foundation row and then the crocodile row) and rows 7 and 8 in the same color. and then repeating like these last bone and green groups for each darker color. Beautiful!!!! Although having worked the alligator stitch on a smaller scale, I am almost afraid to ask how much yarn you needed! But it is absolutely gorgeous. I would like to make an American flag ou of this pattern. Have you any ideas for that? I’ve been playing with it. I drew one that had two crocodile rows each of the red and the white for the stripes. If I try to make each of the stars in the blue field from a “scale”, then with this they wouldn’t have any blue between them. So either the blanket would have to be enormous, or the stars need to be smaller than a scale. Wow! What a great idea for our Flag. I’ll watch for responses on this. Great program here that I’ve just found. I’ve arrived a “Grannyhood” and am doing Grandkid Afghans and then my adult kids want them too! For the stars, do a raised puff/popcorn stitch or, make a separate star and sew it on to the double crochets that usually hold the crocodile stitch. I think the best way to do it would be to decrease at the 25th row by half with slip stitches, and then finish the blanket part of the stripes with the croc stitches. Then go to the side, and create a double crochet square with the same number of stitches you left off. Crochet 50 lace stars and then hand sew them on. The only other way I can think of to add in the croc stitch stars is to still do a separate square, but do the croc stitches on sc with only 3 sc per post. skip 4, and then do another. I’d like to see a stitch invented like this stitch that’s “held down” How did you get all them to lay flat when you took that picture? They will definitely ruffle up with manipulated, but a quick brush of my hand down the blanket was all it took to get them to lay flat. If you really want them to not ever stick up, you could anchor them with a slip stitch in the blanket beneath instead of the chain that is between the two sets of 5 dc making the stitch. It would look a bit different and wouldn’t have as much of the 3D effect of the original. I went through and using a needle, anchored in every middle stitch of each side of the croc stitch, I don’t like them sticking up either. I wondered what the specific colors were, like instead of brown, white, red and green, are there names of the colors on the skeins you purchased? Also I noticed chelsea asked how much yarn it takes, I would like to know also so as to buy it all at once to make sure the colors match and I get enough at the same time. Thank you for your guidance and the pattern is great! I added a “Color” section to the pattern with the color names and a second chart that gives the yarn amounts needed for that color scheme. I hope that is what you are looking for. What comprehensive instructions! Can’t wait to make this. I love the crocodile stitch, I would like to make a queen sized afghan, but I do not want it all the crocodile stitch. How do I incorporate rows of double crochet? Transition to dc row: Ch 3, turn. Dc in second sc, dc in each of next 2 sc, dc in ch-1 space (do not catch part of the crocodile stitch that is to the back of your work), dc between the dc pair on which the crocodile stitch was made, ** 2 dc in ch-2 space (do not catch part of the crocodile stitch that is to the back of your work), dc between the dc pair that was skipped, but catching the ch between crocodile stitches, 2 dc in ch-2 space (do not catch part of the crocodile stitch that is to the back of your work), dc between the dc pair on which the crocodile stitch was made. Repeat from ** across to last 4 sc. Dc in ch-1 space (do not catch part of the crocodile stitch that is to the back of your work), dc in each of last 4 sc. Dc rows: Ch 3, turn. DC in second dc and in each dc across to end of row. Transition from dc row: Ch 2, turn. Hdc in the second dc, hdc in each of the next two dc, skip 1 dc, ch 1, 2 dc in next dc, ** skip 2 dc, ch 2, 2 dc in next dc. Repeat from ** across to last 5 dc. Skip 1 dc, ch 1, hdc in each of last 4 dc. Then proceed with row 6. How much yarn would I need to make an extra large blanket in just one color? Can you help me because I’m not understanding what you have down. 78.99 oz/4146.83 yards. The amounts given in the first chart are for one color blankets. I am making this is the small size and love how it is going so far! The pattern is so easy to follow. I am using a fairly thin yarn and it seems like there are alot of gaps. So I am thinking about adding fabric to the back but I have never done that before. Any ideas? I haven’t done that myself, but found this very detailed account of how to do it. I have crocheted the foundation rows twice.1st time 138 chs and did not come out right for the crocodile. I added eight chains and still did not come out. How many crocodiles should I have with 138 chains. Pls help. I can do the crocodile stitch. With 138 chains, you should have 137 sc on the sc rows. On the crocodile foundation rows, you will have 4 HDC (or ch-2 counting as a HDC) on either end, leaving the center 129 sc. You should have 43 dc pairs. On the first crocodile row, you will have a crocodile on the first and last pair and every other pair, so 22 crocodiles. The other crocodile row will have 21. I have just found your site. Love, Love, Love You. Your patterns, and instructions are great. I am having no problems following them. Thank-you so much. You are truly a very talented woman. Thank you for listing the multiple needed for the pattern. Sometimes one wants to make the item a different size but without the multiple it’s nearly impossible. 1.) Can I make this without the edger crochets? Like the entire blanket solely made with croc stitches? If so, how do I do that? 2.) Would you happen to know the yards/oz of yarn I would need to cover a full-sized bed with some overhang? Or the basics on how to start it? The chains and stuff? Anyway! Your pattern is really easy to follow and I already made the extra-small to get the hang of it. It came out awesome! I like how your instructions were so micro-detailed, since I can be a little stupid sometimes. 1.) Watch the video that I have linked in the pattern. He is making one without the edgings. He explains how the first crocodile starts with 3 chains. 2. A full sized bed is typically 54×75 feet. Decide how much overhang you want. You can double the width of the sizes I give to find the size that doubled gives the overhang you want. You will need 4 times the yarn requirements I list. You will need to double the initial chain plus add three. Hi, adore this stitch and getting started on a blanket for my grandson. Was wondering is it feasible to just use the crocodile stitch and not a border. Not sure if that would totally change the whole blanket. In the video I link to, he is creating a scarf without a border, so you can do a whole blanket just as he instructs. I dont see any instructions for an edging on this though at one point it speaks of the base color for the edging. Do you have a special edging to put on this? The edging is made as you go. I’m almost finished with the afghan. I chose the 38″ and I don’t think it’s wide enough. I think I must have crocheted too tightly. Any ideas as to what I could do to make it wider without tearing it apart. I should have measured. My bad. Any advice would be very much appreciated. You can always add a border in a complimentary color. If you want a border all the way around, make it too short the same amount as it lacks in width. I would love to copy this pattern so I could crochet it. There is nowhere on this page that I can click on and then sit and relax while I crochet. There is an icon at the top that you can use to either print the pattern or make a PDF of it. Is there a way to make a hat with this pattern? Than you ! It looks cute! Finally I found Crocodile Stitch Blanket pattern. It’s wonderful. I was wanting to make this in the round as for a mermaid blanket from the calf or knees down and regular afghan at the top. I have a fin pattern for the very bottom. Just trying to figure all how to do this. Any help would be appreciate. I’ve been looking at these too because a friend was wanting one made. It looks like some are made flat but with shaping to taper to the tail. Others seem to be made in a cone that is seamed at the narrow end and the tail added. I would think shaping with the crocodile stitch would be far from subtle. I had thought of making a rectangular blanket and then folding the bottom edges to the center back so that it was folded in thirds and then add the tail. This would then flair from the seam to give the tapered look. The top edge would just open to the flat blanket. I am looking for a granny square style afghan to make with the crocodile stitch…any ideas.? 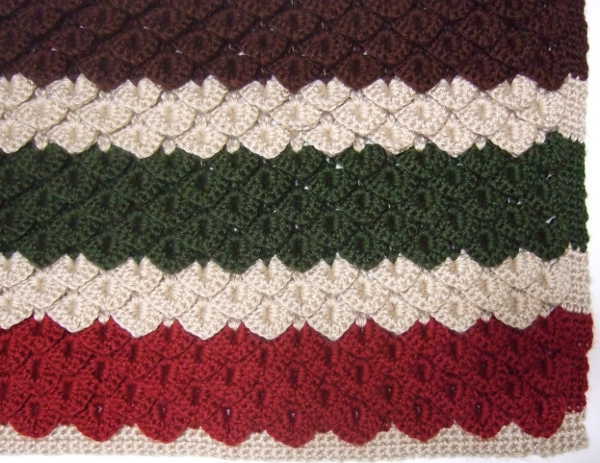 There are three free Ravelry.com downloads by Joyce Lewis that are crocodile flower squares. There were a few more crocodile squares on ravelry that were not free. Where are you putting the edging? All around? Sides? Do your crocodile stitches start on the very edge? I love the pattern and thank you for the comprehensive charts. I’m making a blanket for my oldest granddaughter who just when to college with the school colors. I’m trying to figure out how to end mine. I have the boarder on it like the one in this picture but I’m not understanding the pattern to end it… Can you help? After completing the last row 6 that you want for the length blanket you want, you will put a 4 row sc border. The “fourth to last” row instructions just explain where to put those sc stitches so that they will be spaced correctly and not interfere with the crocodile stitches of the prior row. Is there a specific instruction that is confusing? I love this pattern, as everyone else does; but I have a question. Row 8 starts with a ch 3 after the 4 sc and ends with a ch 3 before the last 4sc. Now in Row 9, after the 4 hdc, it says to skip 1 ch instead of: skip 3 chs or skip ch group. At the end of Row 9 it says skip ch instead of: skip 3 chs or skip ch group. I do have a perfectionist personality, so am questioning this wording. Also am trying to verify if I followed pattern correctly. Thank you so much for sharing this pattern, and, of course, for alerting us where to find a tutorial so we could learn the crocodile stitch. I wasn’t being consistent, so have changed the first reference to say “skip ch” as the last reference says. It is difficult to explain the crocodile stitch without being very wordy, thus the importance of the tutorial. I agree that it still is not extremely clear, but I’m sacrificing some clarity for brevity. My hope is that paired with the video, then the pattern can be more of a quick reference to follow along with after learning the basic stitch. Thanks for the comments. Still working and thinking about Row 9 and realizing that at the end of Row 9, that ch 3 is caught when you put 2 dc between dc pair that was skipped. Have started a double-bed blanket and love the way it looks. I am ending up with more of an overhang than I wanted, but feel that is better than having something too short in width. I think I read some where that starting chain should be multiple of 6. Is that correct? Finally finishing double bed blanket. I do have another question. In 4 th to last row, on Row. 6 there was no ch 2 space. Please try to get me on track to put last sc rows on blanket. I love this blanket. The chain 2 referred to is from Row 5. Just as Row 7 referred to stitches made in both Row 5 and Row 6, so does the 4th to last row. Love this pattern! Thank you! I am wondering would this not work with the self striping yarn. It changes wherever with not particular spacing. So the stripes would not be consistent. But would be easier crocheting in this. It wouldn’t be stripes but would be very pretty. Because each scale uses so much yarn they would probably each be a different color.